dont fall for it because its all fake because the picture is both a fish on a plate and a girls face and a ugly one to! The person who make it ! iv'e seen this illusion before! a girl and a fish and everybody who said there was a split your'e wrong that is hair. omggg...this is soooo kewll!! i love ittt!!! It is a Good Site.It Is Useful For Magicians. How cool I am going to copy this when I get home it looks so cool. What do you think mainly what it is? I think fish no girl I cant make up my mind aaaaaaaggggggggghhhhhhhhhhhhhhhh. 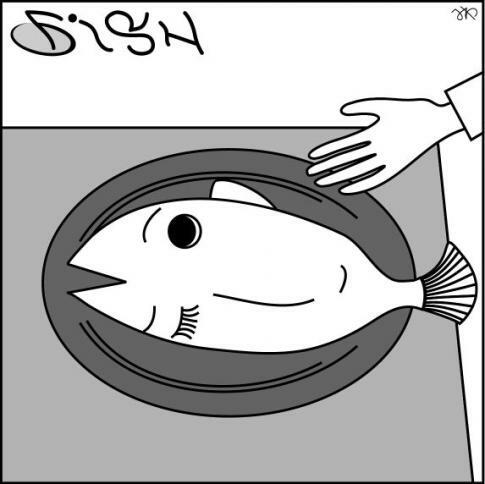 One thing that I noticed was that the sign that spells fish also spells girl. I like the word at the top fish/girl! Very neat. ohh, now i see a girl's face.at first i didnt see it .she's blinking one eye to you.just look at the fish(right) sideways. the gills are her eye lashes.now i get it. it is soooo coool. ok now i tell you, there's a face alright!!! ok look their isent a cut in her forhead its hair! It's both you can see both a fish looking at the image forward, and then turning your head to the left you can see a girl winking. dont you think illusions are obiouslly scary? but is so wowwwwwwwwwwww!!!!!!!!!!!!!!!!!! if you turn slightly the word "FISH" becomes "GIRL"
don't say stuff like that. it's inappropriate. There was no reason to use bad language. on the other hand, THAT WAS SO COOL. I've seen lots of double meaning illusions before, but I've never seen that one. when i finally saw the girl i was amazed!